Posted on October 10, 2015 by Lena K.
After one week, we have received loads of suggestions for the missing few pairings, so thanks a lot for the great help, guys! 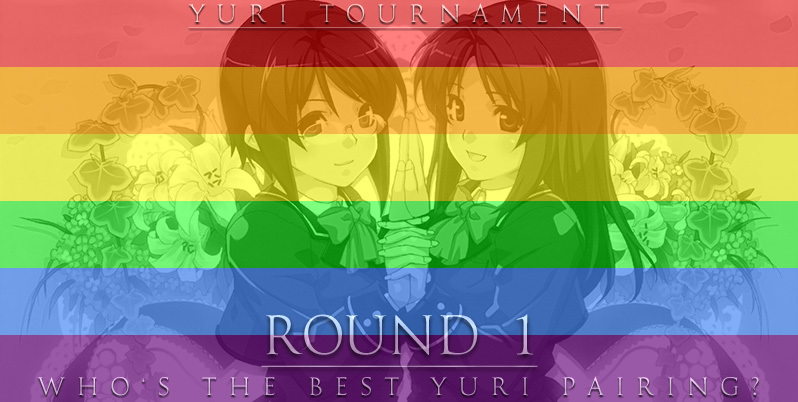 As mentioned in Round 0, this tournament will consist of 6 more rounds, leaving us with 3 pairings in the final round. 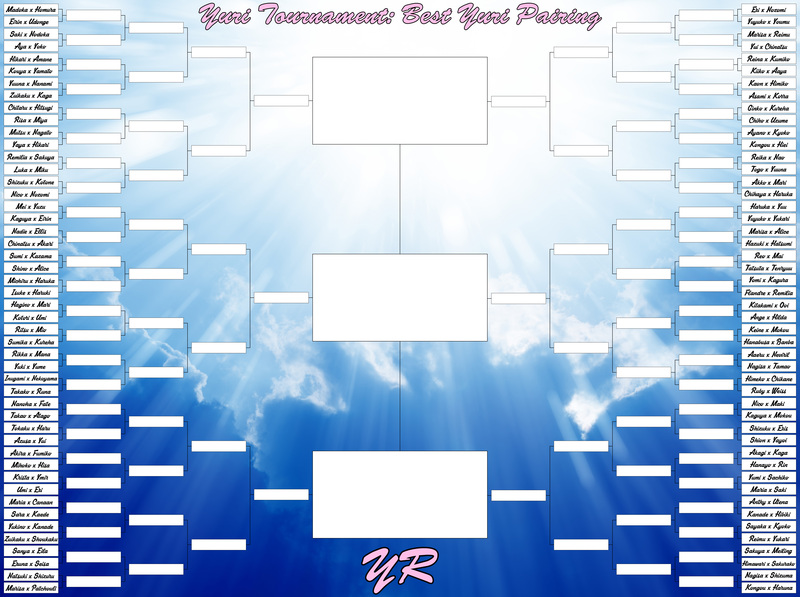 Just like in our last tournament, you’ll be able to choose between 2 pairings, reducing the number of participating pairings by half each round. We yet again went with a mostly random set up, but spiced things up in some specific cases. You will see what I mean after viewing the tournament bracket right here. Since we have now added 6 pairings, instead of only 5 like we said we would, one pairing from our initial list had to move and make room for a new one. That’s why we decided to replace one pairing we thought would get few votes, Akagi x Fubuki [Kantai Collection]. With that said, let’s move on to the tournament. Have fun! Some of those were easy picks and others made me make a tough choice. I have a few favorites, hopefully one of them wins. Wait, there was a round 0? 😀 Anyway, I'm back in Germany and will come a little bit more often to this website. YukaReimu, fight! I really need to get rid of that Kaga and Zuikaku. Sorry Zuikaga fans!!! Maybe, but we already had a problem with having not enough space for everyone. Bless the god! We ride on the same ship!! Chikane x Himeko hands down the Goddesses of Yuri. No questions asked. Period. The red kind. Amen. Those peeps who think Citrus is classic got something coming to them! Yay, for Rikka x Mana! Hope the best couple win! 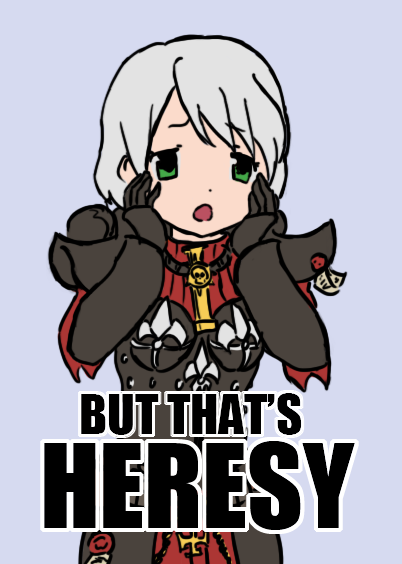 @Anon: You should be afraid of the outcome of this one. It was mostly random, so we can't help it. Is it bad I don't know nearly 50% of the characters here? If I was at a total loss I just didn't vote. Also after rewatching .hack//SIGN, I wish Subaru x Tsukasa was in here. I can't wait to see the results, though I'm pretty sure, I'm going to be disappointed since most of my favorite pairings are not all that popular. I'm hoping Ayano x Kyoko get more traction as they had some screen time in the second ep of the new season of yuruyuri! In this tournament, we have some problems with missing space. Since we have pairs of characters competing against each other, it's a little harder to list them in a neat manner, which is why we left out the names of the series those characters are from. If you're having problems recalling what series they are from, just go back to Round 0. True I guess, but it feels like Touhou swamped this selection a bit, and so I ended up voting for the opposite pairing usually. I just feel Subaru (IRL: Mariko Misono) x Tsukasa (IRL: An Shoji) is an interesting pairing because of the story around the two, Tsukasa having her memories altered to make her think she's a guy, and Subaru coming to terms to her feelings for what may be a woman. I also like how wayyyyyyyy ahead of it's time it was with online gaming and how people interact and come together. I sometimes wonder if the only way I'll find love is online, but then you have to realise how other people treat the internet. Blah I've ranted and gone off topic, sorry. Shizuru x Natsuki. OTP Yuri couple right there. I can't believe I forgot to nominate Sae/Hiro from Hidamari Sketch during round 0. They have such a great dynamic as a couple.